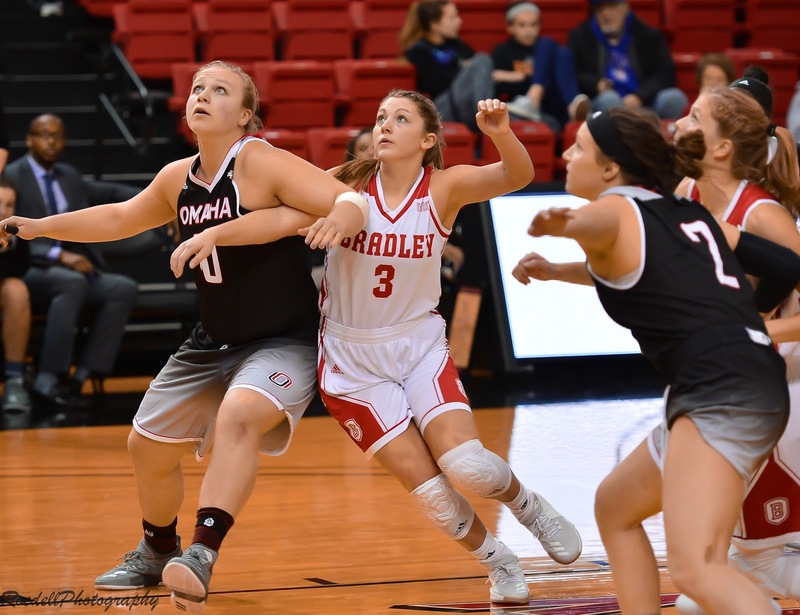 Peoria, IL - The Bradley Braves (11-10) (5-5) were looking to rebound at home against the Valparaiso Crusaders (10-11) (3-7) Friday evening, just five days after two weekend losses to both Northern Iowa and Drake. The Braves were also looking for their first home win since December 28th against Western Illinois. The game got off to a fast start for Bradley. After the game was tied 4-4 roughly three minutes in, the Braves would outscore Valpo 15-4 the rest of the quarter. In all, seven Braves hit the scoring column, paced by Gabi Haack, who had 5 points in the first quarter. Vanessa Markert and Shunseere Kent also added 4 points apiece in the first. Bradley would hold a 21-8 lead after a quarter of play. The second quarter was much of the same for both sides. Bradley used a 12-2 run that covered all but three minutes. The run was capped off by a three-point play from freshman Emily Marsh to put the Braves ahead by 23, 33-10. The lead was Bradley's largest of the game, and they would use that run to maintain a 21-point lead at halftime, 35-14. The second half would be a completely different story. After just a 14-point first half from the Crusaders, the visitors would score 14 points in the third quarter alone. In fact, that 14th point came at the 5:00 mark of the quarter, when a layup by Valparaiso's Grace Hales made it 42-29 in favor of Bradley. Despite a furious comeback in the third, Bradley was still out in front by 15, 52-37, with just one quarter remaining. The Crusaders continued to push, and they just would not go away in this one. At the 3:18 mark of the fourth quarter, two free throws from Valpo's Meredith Hamlet got the visitors within 10, trailing Bradley just 60-52 after the free throws. The game would get even closer, when the Crusaders' Caitlin Morrison hit a three with 1:12 remaining to make it 61-55 Bradley. Despite Valparaiso getting as close as six, they would need to start intentionally fouling, and that put this game out of reach, and Bradley would come out on top, 69-58. Gabi Haack finished with her second career double-double (13 points, 11 rebounds) for the Braves. Shunseere Kent led the Braves in scoring with 14 points. After the game, Bradley Head Coach Andrea Gorski said that they had an idea that Valparaiso wasn't going to have the same first half offensively in the second half. "They're a pretty good three-point shooting team. We knew we weren't going to hold them to that shooting percentage for the whole game. I just thought we lost track of our game plan defensively. Offensively, we were just out of rhythm. Both Gorski and Haack continued the theme of focus. Haack thought that the second half came down to the fact that "we should've just been more focused". Another stat that Gorski was not pleased with was the turnovers. Headed into Friday's game averaging 15 turnovers per game, Bradley had already committed 11 turnovers. By game's end, they had 22. "22 turnovers is way too many. We just have to do a better job of making sure that we take care of the ball and stay focused, all of us, for an entire game." Haack thought that it was good to see the rebounding aspect of her game work the way it did against Valparaiso. "Rebounding's a big part of my game, and it's important for me to get those." Shunseere Kent's 14 points were something Gorski was very pleased with. "It was good to see Shun get her shot back and play a little more aggressive. When she came in off the bench, she just had so much energy for us today." She also thought that Gabi Haack performed well when the team as a whole wasn't where she'd like. "I thought we were a bit complacent in the second half. She kept cutting and moving. She got some layups and got to the free throw line a little bit. She was by far our most active player today." The Braves' win marks their first win at home since an 87-80 win over Western Illinois back on December 28th. Gorski was glad to see that four-game home losing streak end. "We've been close. I think we can learn some lessons from that second half and get ready for an improving Loyola team on Sunday." Haack emphasized the focus for the team when preparing for the Loyola Ramblers on Sunday. "We just have to keep our energy high, keep our focus high. Loyola's a good team. We just have to go into the game focused, know our goals, and know our roles." The Braves will host Loyola Sunday at 1:00 pm.